For the month of February, our challenge is to "Let your light shine!" Your project must have a lighthouse as the main image. Please also tell us how you are letting your light shine this month with your project. We have a wonderful guest designer this month - Mrs. A.
Hi I'm known to everyone in blogland as Mrs A. Mum of two with 3 grandchildren to keep me on my toes. I love to make and create and mixed media is my forte. Have only recently in the past year found a new passion for making cards and like to experiment with different types of design and adding unusual elements to my cards. Check out Mrs. A's blog It's an Alien Life and leave her a little love for being our guest designer. The design team has made some incredible lighthouse creations to share with you, prepare to be enlightened! Truly amazing artwork! 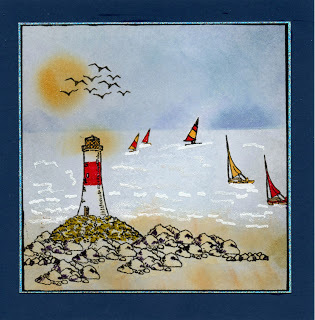 The random winner this month will receive an Art Impressions lighthouse stamp from me. Now it is your turn to shine your light on us all with your wonderful "lighthouse" creations. You may enter up to 3 times and as many challenges as you wish. If you do not have a blog or account on Split Coast Stampers, then just email me a picture of the piece and I will add it to one of our posts. 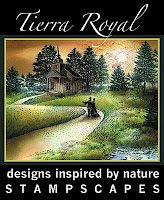 We only want to see finished stamped or digi scenes (no ATC's or unmounted work). If you are not sure what constitutes a scenic project, check out the information here. Don't forget to add GDT to your link if you wish to be considered for a guest spot just like Mrs. A. Thank you so much for asking me to be your Gust Designer for the month of February. I enjoyed the challenge of creating a light house scene. Hugs Mrs A. Love the new header. Visited you over in blog land too. Final Week - Let Your Light Shine!